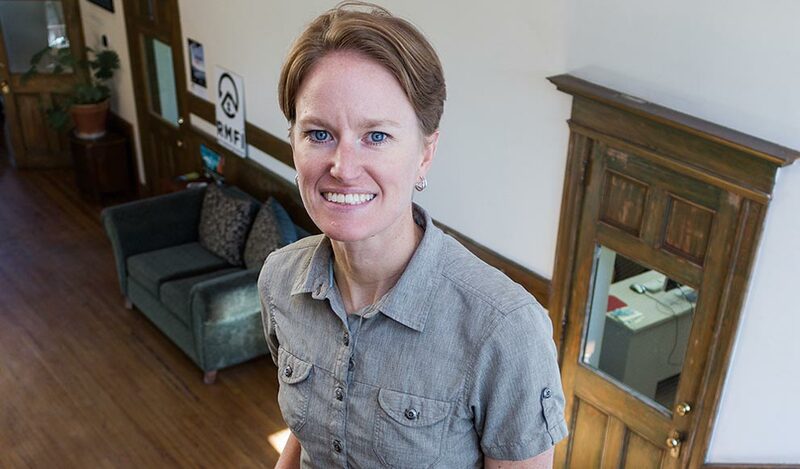 As executive director of Rocky Mountain Field Institute, she oversees a team of 18 staff and hundreds of volunteers, managing complex ecosystem protection projects, research and education programs and major restoration initiatives. RMFI projects during the past two years include restoring fire- and flood-damaged land in the Black Forest and Waldo Canyon burn scars, emergency stabilization of hill slopes, revegetation and erosion control, and building and restoring parks and trails, including landmarks like Garden of the Gods, Barr Trail, Kit Carson Peak and Cheyenne Mountain State Park. The new year has brought challenges for environmental protection groups nationwide, as they attempt to predict the impact of President Donald Trump’s policies for environmental regulation and funding. But Peterson said she has seen overwhelming community response to RMFI without the nonprofit even needing to “raise the political landscape” with the public or its volunteers. She recently discussed landing the job of a lifetime, the growing importance of environmental stewardship nonprofits and an unexpected rush of support for RMFI in 2017. How did you get to Colorado Springs? My dream was to be the director of an environmental stewardship nonprofit, never thinking I’d have the chance. I was willing to go anywhere, but I Googled ‘Colorado nonprofit job’ and RMFI came up — sure enough there was an executive director opening! It was almost too good to be true. When I saw they were located in Colorado Springs where my brother lived, it seemed like it was meant to be. … We were always really close, so it’s been a chance for us to reconnect as twins, coming back here. It’s my dream job — I feel really lucky. What attracted you to nonprofits? It’s a different connection with the community. Nonprofits have the unique ability to bridge gaps where for-profits can’t and where government entities don’t have the capacity. So nonprofits fill this niche of doing really needed work that for whatever reason isn’t getting done. … It’s the opportunity to do truly meaningful work and feel like you’re making a difference — and I knew I could match my passions with the work. Do you foresee challenges for the role of conservation nonprofits? I think change is inevitable — the extent of that change remains to be seen. So parts of us are nervous and anxious, awaiting how things will unfold. But an unexpected consequence of the result of the election has been extreme positive feedback from random people across the country and within our community, who have come to us and said, ‘I’m sick with what’s happening; I’m devastated; I don’t know what to do except I want to give back. What can I do? How can I get involved with RMFI?’ And that’s come by way of financial contributions from people just out of the blue saying, ‘I can’t impact what’s happening in D.C. right now, but I can impact what’s happening here in my community. You guys are helping protect the places I love … and you guys are who I want to support.’ We’ve had people stop in the office and say, ‘Tell me about your volunteer opportunities, tell me other ways I can get involved.’ That’s been an extremely positive but unexpected result of the election. From the environmental side … there are rumors of public lands being sold off or the EPA going away, which means environmental regulations might be reduced. All that is going to make the work we do more critical and heighten the importance of public lands and stewarding them so that future generations have the opportunity to enjoy them just as we have. From a funding standpoint that’s interesting too — who knows about any funding freezes or things happening with the federal agencies? … We haven’t gotten funding from the EPA but we get funding from federal agencies, from the Forest Service and the BLM [Bureau of Land Management]. So if, for whatever reason, their budgets are severely reduced, that might come back to impact us. But at the end of the day, most of the money we get from those [agencies] is [for] burn restoration work or the protection of the greenback cutthroat trout, which is a threatened species, so that’s not going away per se. I think it’s just going to increase the importance of the work we’re doing and hopefully that will result in good things for RMFI and good things for the community. Does that change how you interact with the community? I don’t know. … We would never bring up the political landscape. Other organizations are better positioned to make that connection. But we’ll always continue to engage with the community through volunteer work days, and it does provide that extra platform to stress the importance of the work we’re doing. People who volunteer with us are watching the news — they know what’s going on. They can make that connection without us having to make it. But the more we can tell our story and show our impact, the greater the engagement we’ll continue to have with the community. What do you want people to know about RMFI? The majority of people are here because they have that passion for the outdoors, and we’re the boots-on-the-ground organization out taking care of the parks, trails and open spaces that everyone loves. … We’re one of the primary groups out there working in all of our iconic and treasured public natural landscapes, making sure that these public lands in our region are protected forever. We’re always looking for volunteers, so I would encourage anyone interested in learning more to visit our website, come out and volunteer with us on a work day. There’s truly a variety — from our urban city parks to Fourteener work in the Sangre de Cristos. We’re doing meaningful work, so I’d love people to come and get connected with us. If you volunteer building and maintaining a trail, you get it. Your appreciation for that trail changes, because it takes on a more special meaning. It’s through the physical act of giving back and personally caring for a site that people become deeply invested. Where did you get your passion for environmental protection? My dad loved the outdoors, and he instilled that in us. Every summer my dad and my twin brother and I would take trips, sometimes to Colorado — and at the time we lived in Connecticut, so we’d spend countless weekends on the Appalachian Trail. … To this day I thank him, because I can trace it back to having that experience. It instilled in me the love for the outdoors and the passion to protect it.